Despite Derrick Rose having his best game in over a month, the Chicago Bulls keep losing, this time 105-99 at home, in yet another performance that is far less than satisfactory, especially on the defensive side of the ball. 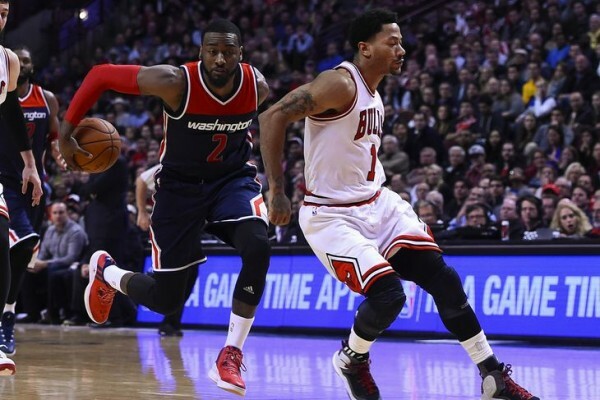 John Wall scored 21 points and Paul Pierce led the Wizards with 22, as they handed the Bulls a second consecutive loss and their fourth in five games. After doing so well to climb up the Eastern ladder and get close to the Hawks, that number one spot in the conference is slipping away from them once more. The Wizards are a lot closer, although four games behind is still some ground to make up. Derrick Rose scored a season high 32 points, but it wasn’t helpful in the end. Jimmy Butler had another rough shooting night, scoring just 13 points. Pau Gasol once again struggled against the Wizards’ rim protection and finished with 13 points. The bench unit did well as once again the minutes with Aaron Brooks and Nikola Mirotic provided the most successful spurt for the team, but with Noah playing only 13 minutes and Tony Snell not delivering what Dunleavy would have, the Bulls just looked like a team with too few options on offense for most of their possessions. The Bulls are in something of a slump. Mike Dunleavy is injured and Joakim Noah might be out again for a while, leaving the game early with an ankle injury. Jimmy Butler, until last week mentioned along with Stephen Curry and James Harden as a potential MVP candidate is going through a slump, averaging only 13 points per game in the last five and not once shooting 40% from the field in these four games. One might suggest there’s a mini identity crisis with this team, but they’re not playing all that well on offense also. It is basketball. You can’t play this sport and be perfect. We’re just going through a little bit of adversity right now. But it seems like guys are trying their hardest and it’s just not going our way right now.